“Architecture embraces the whole form-world of man’s physical accommodations, from the intimacy of his room to the comprehensive labyrinth of the large metropolis.” Eliel Saarinen. 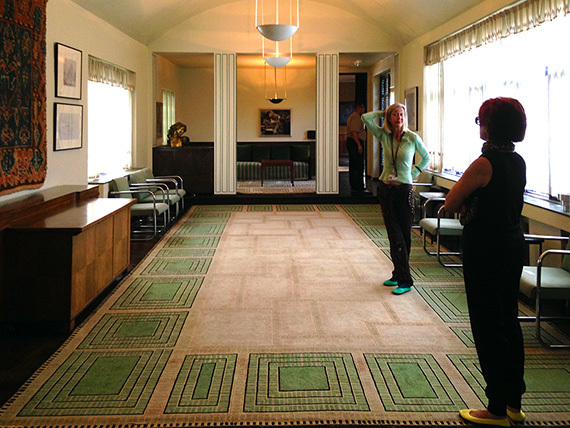 We found out about the Cranbrook Art Academy and the Saarinen House by pure chance: our architecture-buff friend mentioned it when we talked about my upcoming presentation at the Detroit Public Library. We immediately decided to schedule a private tour of the House. And what a great discovery it was! 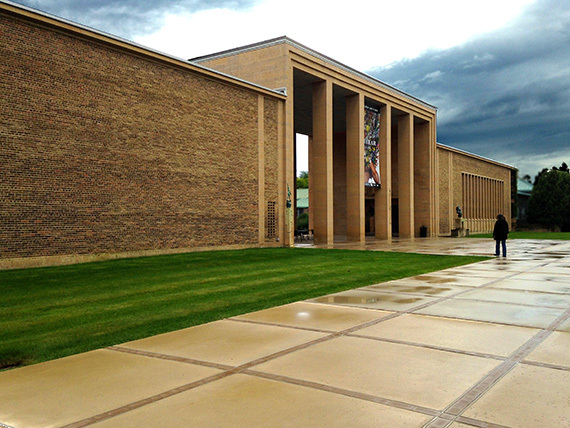 Cranbrook Academy of Art, called “the cradle of American modernism,” is a small, highly-selective graduate school that since 1930s has been influencing the fine arts, architecture, and design on international scale. Located on the 300-plus-acre estate in Bloomfield, an affluent suburb of Detroit, Michigan, the academy is at the heart of the Cranbrook Educational Community, which is often described as “one of the most enchanted architectural settings in America.” The idea of an educational community dedicated to art was a brain child of George Gough Booth, a Detroit multimillionaire, who made his fortune in publishing. 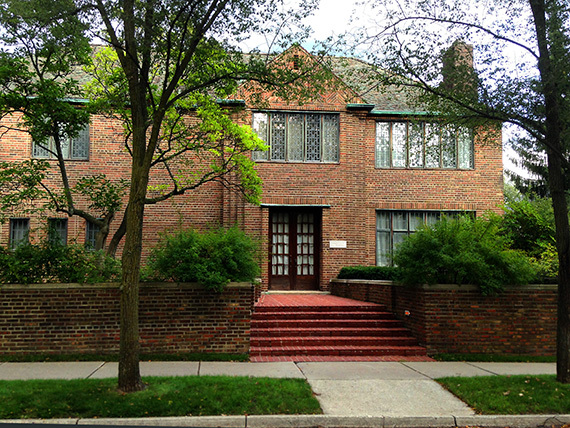 We were told that virtually everything published in Detroit was owned by this Midwestern “Citizen Kane.” Booth also knew a thing or two about the arts: inspired by the British Arts and Crafts movement, he closely followed contemporary modernist architects. Booth first approached Eliel Saarinen, a famous European modernist, in late 1920s, when this Finnish architect was a visiting professor at the University of Michigan. When after World War I, Saarinen decided to leave his home country, Finland, because he could not find any major commissions , Booth invited him to move to Cranbrook and design – just about anything, from landscapes to buildings – to create an educational community. 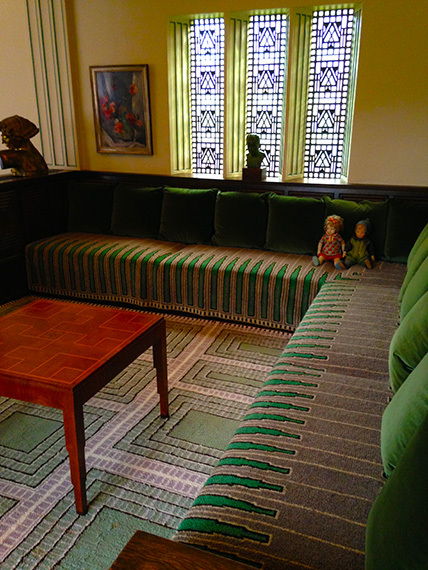 Beautiful Cranbrook hills and meadows became a canvas for the genius architect, on which he created an innovative blend of Art Nouveau, Art Deco, Arts and Crafts, and Swedish Modern with his own vision of a universal beauty, where man and nature united. The Cranbrook School for Boys was completed in 1928, Kingswood School (for girls) in 1931, and the Cranbrook Art Museum and Library building in 1942. Eliel Saarinen became the first President of the newly-established Art Academy, where both he and his wife, a textile artist Loja Saarinen, taught. Every architectural and decorative detail outside and inside the buildings – chest of drawers and closets, beds and bedcovers – were designed by the Saarinens. 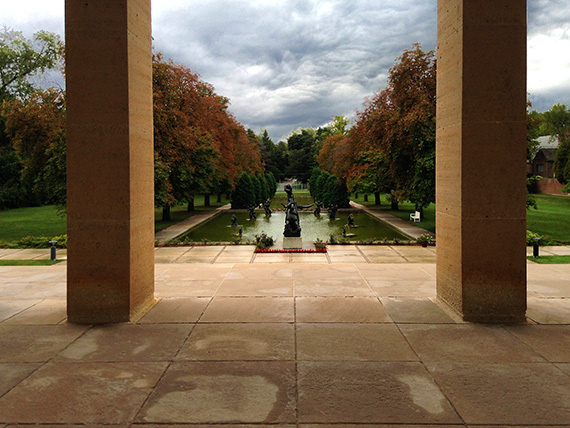 The park that surrounds the Cranbrook Museum of Art, also designed by Saarinen, is a complete work of art on its own. 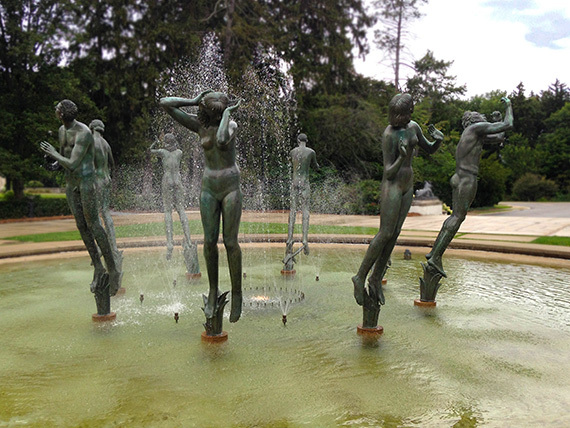 Comprising reflecting pools, ponds, walking trails, herb gardens, and a superb collection of outdoor sculptures, the garden is considered one of the twenty five “most amazing sculpture gardens” in the world. Approaching the Art Museum building from the parking lot, we were drawn to the giant Orpheus Fountain designed by the renowned Swedish artist Carl Milles. Familiar with his famous works in Stockholm, we immediately recognized his style. Milles served as a Chairman of the Sculpture Department at the Academy until Saarinen’s death in 1950. His sculptures are spread out throughout the gardens and around the Museum. 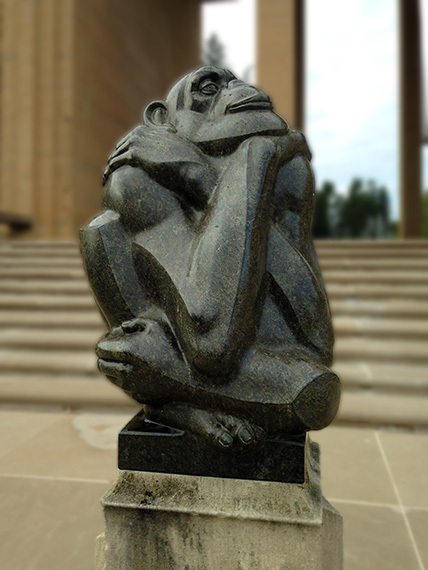 Just like our Cleveland Museum of Art has Rodin’s Thinker in front of the building, the Cranbrook Museum also features its own Thinker by Marshall Fredericks: …a monkey, whose back is strangely human, is gazing at the sky, seemingly immersed in deep thought. Experiencing the gardens is a personal journey: you have to take a leisurely walk-through to truly understand the Saarinen’s unique way of uniting architecture, nature, and art. For us, walking in these gardens was a process of endless discovery: new vistas and angles, one after another, revealed the unity and coherence of the initial design. One of the most remarkable masterworks of the 1920s, the Saarinen’s landscape reflects the ideals of the Arts and Crafts movement where man is at one with nature. 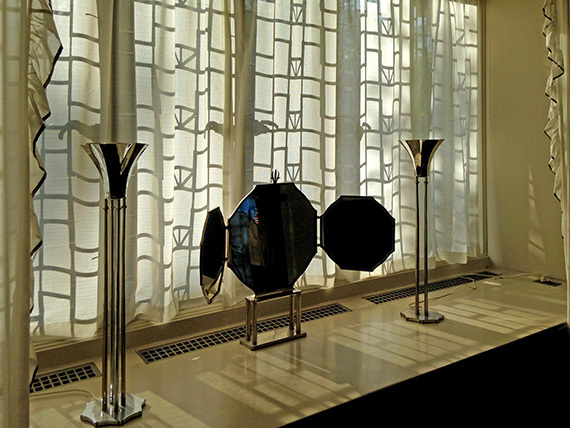 Designed in the late 1920s, Eliel Saarinen’s house is a true masterpiece of his unique blend of modernist movements. 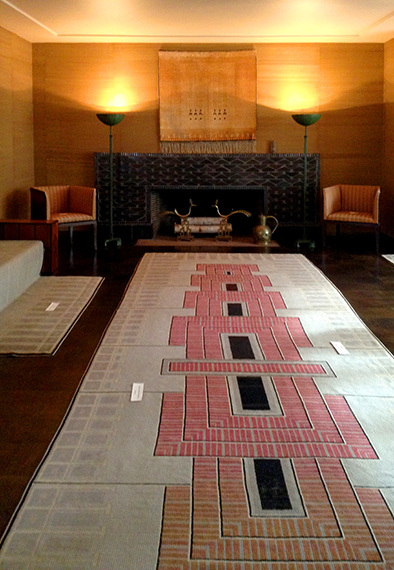 Until Saarinen’s death in 1950, the house served as his and his wife’s residence and studio. Subsequent presidents of the Academy significantly altered and redecorated the house according to their tastes and needs. In 1977, then-president Roy Slade began a complete restoration effort to return the Saarinen’s house to its original form. A leading proponent of the latest modernist movements in the United States, Saarinen thought of architecture as a total art where every detail – from silverware to furniture, doorknobs and carpets – is an integral part of the designer’s overall vision. The house represents a collaboration of the entire family: Loja, the textile artist and Chairperson of the Weaving Department at the Academy; daughter Pipsan, an interior and glassware designer; and son Eero, who later became one of the towering figures in the architecture of the 20th century – they all contributed to the magic ambiance of the Saarinen house. The House could be seen only on a guided tour. Public tours are offered from May through October. 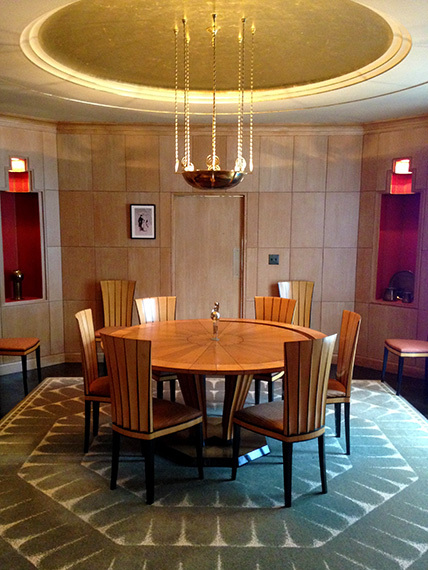 We, however, highly recommend a private tour to those who want to learn more about the architect and American Modernism. This entry was posted in America, Art and Artists, Travel Photography, United States of America and tagged Cranbrook Art Museum, Michigan, Saarinen, Saarinen House. Bookmark the permalink.